An interesting cultural thing happened today. A man came in to borrow some recording gear and asked if we'd ever have this situation. 'When people die in my village, all of their pictures are gathered up and burned. All memory of that person is destroyed, all evidence of them is taken away. I have told them 'we like to keep pictures of our dead, to remind us' but the people wouldn't listen. So I am wondering, if I do an audio recording of the Bible, and that person dies, will they want to destroy the recordings? Has anyone ever asked you this type of question before?" I think that possibly, you could mix up the voices enough so that it's impossible to ignore or destroy the voices. I still am unsure why they do this, but it definitely creates a new challenge. It is most likely superstition based. We want the audio to last for several generations, so destroying it would not be an option. He is going to investigate if this is truly going to be a problem or not. And if so, it may mean that group doesn't get a recording. 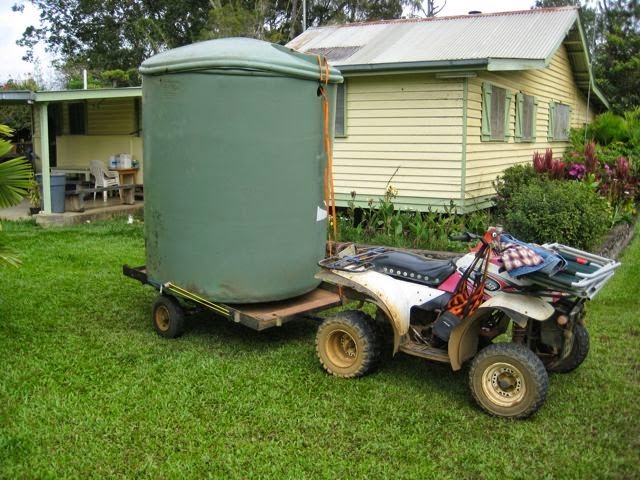 Well, really it's an Ukarumpa pick up truck. 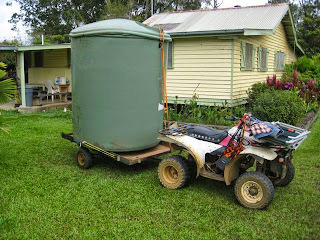 This is our four wheeler ATV with a trailer on it, hauling our empty water tank, up the hill 1km. We're having to move, but since partners paid for us to have this, we're taking it with us to the next house. I was tempted to call this 'Ukarumpa fire truck'. the beauty of this country on the coastal areas. If you have questions for us, that you would love to have answered, contact us. I'm itching to do another video and I got the idea that we could answer your questions on video. It would be fun if our family went around to different places in the country, and video recorded our answers to your questions. You could see different places as well as get an answer. Please send in your questions and then watch the blog for the answers as we produce them. Hopefully you have our contact information. You should be able to reach us on facebook or at our email address which you have already. And the Bible in Audio version played a role. In 1978 a language project began in the Madang region of Papua New Guinea. That was 35 years ago. 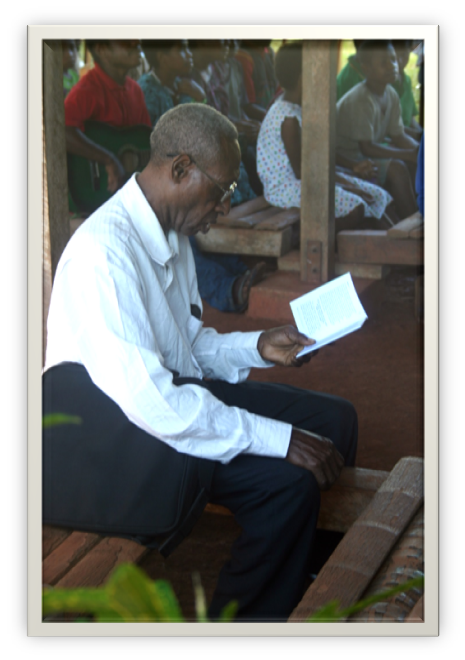 In 2013 a Bible dedication took place in the Maia language, with much of the New Testament and portions of the old. It was not a complete Bible, but it was the completion of the project. Or was it? A few single women branched out of the multi-language project in 1982 to keep their Maia project alive. It was flourishing while the other language projects were coming to a close. They had a house built over time, and a training center over time, and continued on working to translate and teach the people to read and write. But they quickly found that unless they were there, the work wasn't progressing. In fact they faced a great many discouragements. People not interested in learning to read, and then, even when they could read, they didn't understand the meaning of the words. Comprehension was very low. 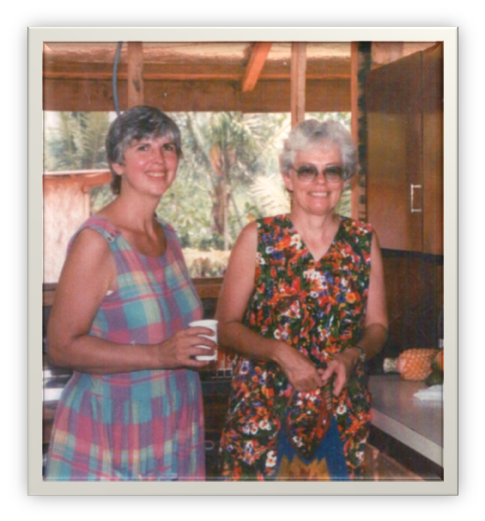 There were times in the project (that lasted over 25 years) that the ex-pat women asked themselves "is it worth it?" There was discouragement, failure, but never quitting. in 2013 it was decided that they would retire and end the project. It was running out of steam, and they decided on the council of others, to hold a dedication for what they had finished. A dedication is a ceremony, akin to a wedding. There is a lot of planning involved, and it takes a lot of effort to get people to the dedication. It is a ceremony meant to present the finished Bible to a people, as well as commit that Bible to God and give Him thanks, as well as pray that the Bible changes the lives of the people and is used. The ex-pat women decided 'We have done the work to make this Bible, surely you can plan the party'. And left the area to the locals to plan the dedication. 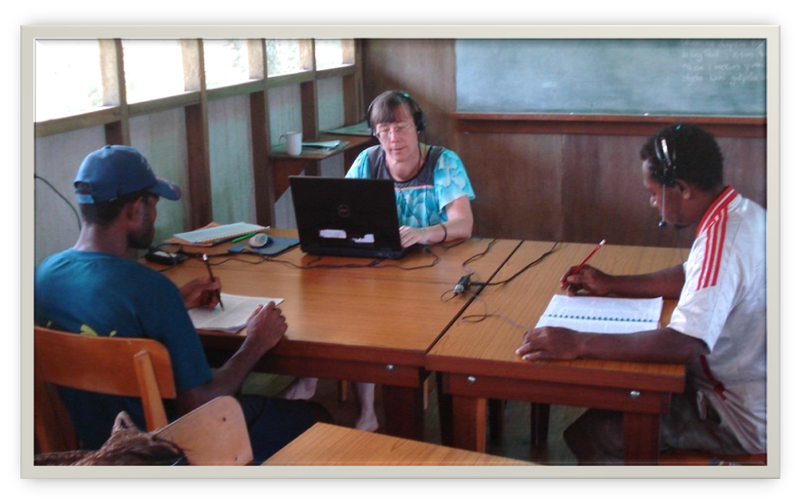 During that time, in 2009 one woman took a recording class offered by my department (Scripture Use Media), and began recording the Bible in audio format, with the goal of having an Audio Player ready at the same time as the printed Bibles were for the dedication. The two could go side by side. In November 2012, I was asked to handle this project. It was my first project since coming over to the Audio department from the Computer department. I was asked to help edit and post-produce the Maia recordings and to compile them onto AudiBibles in time for the May dedication. It seemed like a possible goal, but I knew that given life in PNG, it could come down to the wire. I actually had completed them and had them shipped and ready to go, in June, giving me plenty of time to redo any errors (which did happen). In May the ladies returned to the village to see how the planning had gone. It hadn't. Only 3 of the 18 villages had any interest in helping, and from that, nearly no one had joined the planning committee. 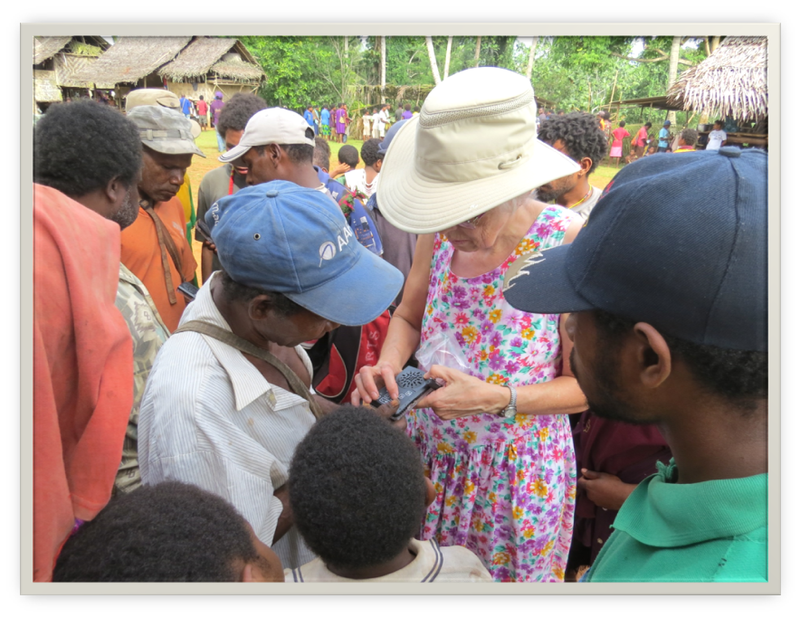 The ladies were faced with apathy, and were not only discouraged, knowing that people had already booked flights from outside of PNG, they were considering how embarrassing the day could be. "I'm sorry but I can't buy the solar kit, I don't have enough money, my wife and I have decided to buy a Bible and an Audio Bible from you instead"
Linda needed no apology, she was excited that someone wanted the Bible! She sold it to him and informed him that there would be more for sale at the time of the dedication. Soon all the sample Audio Bibles Linda had were gone. People were playing them and listening to them. 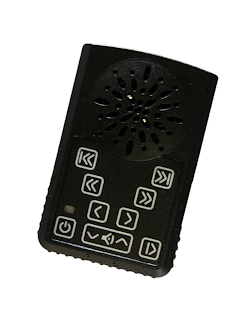 One man said "I turn it on at night in my home, and soon the entire home is filled with people!" Another said "I've read the Bible and saw that Jesus did things and went places, but when I hear it in my own language, it comes alive, as if He actually did all those things!" Excitement was growing. The apathy was gone. Word was spreading quickly that their Tok Ples (heart language) was alive again, and real! And that stories of Jesus were inside the player! Suddenly the dedication planning went into full gear. A man went on a long hike along a ridge telling people of the dedication coming, and the audio players. 18 villages were suddenly involved. They realized that they had not enough food, not enough places for people to sleep. Everyone got involved planning for the day of the dedication. The dedication started at 4:10am because several of the villagers woke Linda and her team up and said 'we must pray for today!' and they prayed and sang songs of praise to God. The day itself was amazing. Dances, songs, speeches, preaching, decorations, and most of all, people were buying the Audio players and the Bibles and honoring Linda and her team with thanks. All day and all night you could hear the Audio players playing. You would hear people talking and moving towards you and realize people were listening to the audio playing Scripture while they were walking from place to place. Soon the first day after the dedication a woman came and said 'mine is no longer playing.' It was explained to her she wore out the battery and would have to wait until the next sunlight to charge it again in the sun. Conversations were happening and people were asking questions about Christ. People were engaging with the Scripture, and the Maia dictionary was sold out. Sales of that particular book were pitiful before, and now, they needed to print more. The event of Audio was turning things around, God was using this tool to speak to the people in a way that the Word came alive to them! Not only reading, but HEARING in their OWN LANGUAGE for the first time. One man asked "Why didn't we know sooner that you had these players, we could have been saving our money!" Before the audio players, there was a huge problem with getting people to want to read, learn to read, and then understand. One night an older gentleman was sitting and listening to the Word, and he said "I'll never be able to read. I am too old to learn." But a friend sitting near him comforted him and said "I was just like you, I couldn't read, but then I listened to this, and followed along in the Bible here, and it wasn't long before I could read it... YOU CAN TOO!" The Audio players were breaking ground in the area of literacy where the ladies seemed to be forever struggling. It was time to say goodbye to the women who had brought them this gift, who had labored for decades to give it, who had faced discouragement repeatedly, obstacles regularly, and who had reached the age of retirement. These women who only a month before had thought that things would end poorly, were now being thanked and honored with gifts and visits and food. So much food. Typically when you leave a village, there is fighting and arguing over who gets your stuff. Who gets your house or gets to tear things from it to use it. There was none of that. Things could not have ended better for these ladies. God was honored. One family came, who had for many years not been supportive in fact, had been problematic for the team and the wife said "I want to thank you for doing His work. This has brought me back to God. I bought one of the players for my son to listen to." Imagine hearing such a thing from someone who has stood as opposition to you for so long. God's Word, changing lives. As they were packing to go, food kept coming, people kept visiting, and you could still hear the audio players playing day and night. 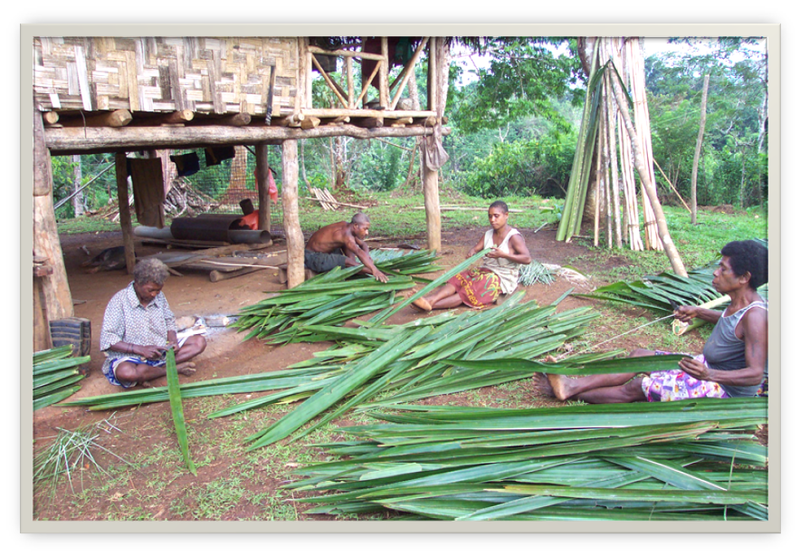 One man said "We were losing our language to Tok Pisin, but this work has strengthened our language and made it alive again!" Another man thanked them for making their tok "clear". The women realized they were part of something momentous. Wondering for many years if the work was worth it, they realized, that yes.... it was. They were feeling at the end, very blessed and that their labor had been worth it. They were feeling honored to be involved in what God was doing. "I felt many times that I was terribly inadequate, my only courage was because I was part of a team. I was very humbled in the end that they said 'you were here in the good times and in the bad times and you prayed with us.' I never really considered that anything more than part of daily life, praying with others. But they did." Linda thanked the teams that supported them over the years. Computer departments, Aviation, linguistics, support teams, support staff. People like you. Jacob. 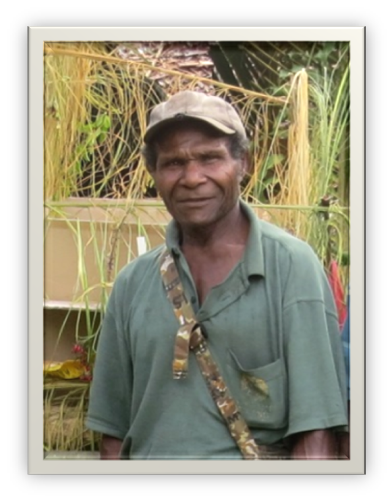 A PNG man named Jacob one day was walking along the road, back in 1978 and he happened upon a pamphlet on the ground that had perhaps fallen out of a passing vehicle. He read it. It was about our organization and how we do Bible translation, and he wanted that for the Maia people. He contacted us, and that is how things began. Now 35 years later, Jacob is a much older man. You can see his tears in the video below as they were carrying in the Bibles. Mabel (another PNG man on the team) called Linda the other night and said 'I really want the rest of the Bible." A man named Elbert called from a neighboring dialect and said that now his people want to know how to get a translation project begun in their language. In the 80's his people had complete apathy for their heart language, they were going for Tok Pisin ( a common language lacking the fine detail required for understanding many Bible concepts deeply). There was a resurgence of interest in Tok Ples (heart language) and possibly they could begin a locally owned and managed translation. If you could make a movie about this, I'd imagine it would start with that pamphlet floating out of a window and to the feet of a PNG man named Jacob. It would star some aging single women who spent their days sweating under the hot sun, bending over books. It would flash back to the people in their home churches, dropping money in a donation plate, saying prayers, reading newsletters. It would finish with a large fish dancing across a field, and people in grass skirts. And it would fade slowly out, on a child listening to and reading the Word of God in their heart language for the first time. And in the final moments, of black, you'd still hear the Word of God, as you did in the village at night... because the Word of God endures forever. On a trip into an isolated mountain area of South Asia, my wife, Dallas, and I met a lady who is 100 years old. Some years ago, the Good News reached her village and she became one of the first believers. God’s Word did not exist in her language, so she and others in her village worshipped in the state language. 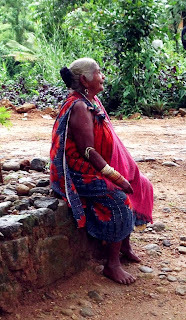 She is part of a language community that has been estranged from a neighboring group for nearly 100 years—her entire life! Their languages are very closely related, and they share a common oral history, but for the last century they have also shared a strong desire to avoid each other. At times they have viewed each other with outright hostility. Recently, however, that hostility has begun to melt as the result of Bible translation. A team from each of these languages joined a multi-language Bible translation project—a “cluster project”—and began to translate the Gospel of Mark. Each team translated for their own people, sharing skills and insights with teams from other related languages. When the teams from the two antagonistic communities finished the Gospel of Mark, they decided to hold a joint celebration to dedicate the Scriptures. It was an amazing success! The Scriptures brought the two communities together for a time of rejoicing around the recently translated Good News. According to the South Asian partner who accompanied us, this may have been the first time in 40 years that the groups came together for anything! The Spirit of God is at work in the South Asian mountains, drawing men, women and children to Himself with the good news that they can be reconciled to God and to each other through the Message of Hope. Dallas and I were witnesses to this living example of Paul’s ancient and true words, and we were filled with wonder as we tried to imagine what it must feel like, particularly for this 100-year-old lady, to live without the Word—and then to receive it and watch it begin to transform two communities. After many years of relating to God in a language that came in from the outside, this elderly believer can now hear the Gospel in her own language. She can sing worship songs with other believers in her own language. She can respond to God and to the neighbors on the other side of the language divide in new ways because now God speaks her language! 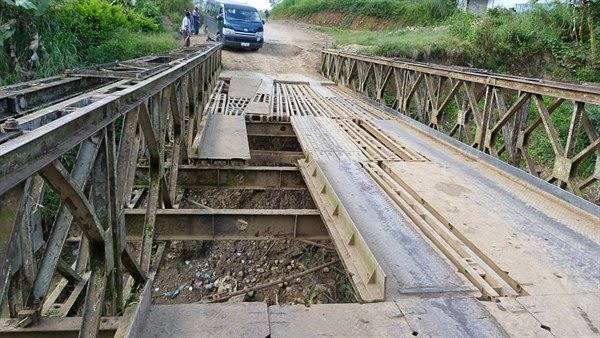 the bridge is out... again. prayer for remedies to the bridge. One of the things we do is train PNGians to translate the Bible. They learn portions of Hebrew, and go through 4 years of training classes which is much like a custom built university for teaching them how to translate the Bible on their own. Training and Equipping is part of our strategy to help them be less reliant on the highly trained Ex-pat and be able to do the work more on their own. This month 2 different courses finished! (it's a big undertaking). 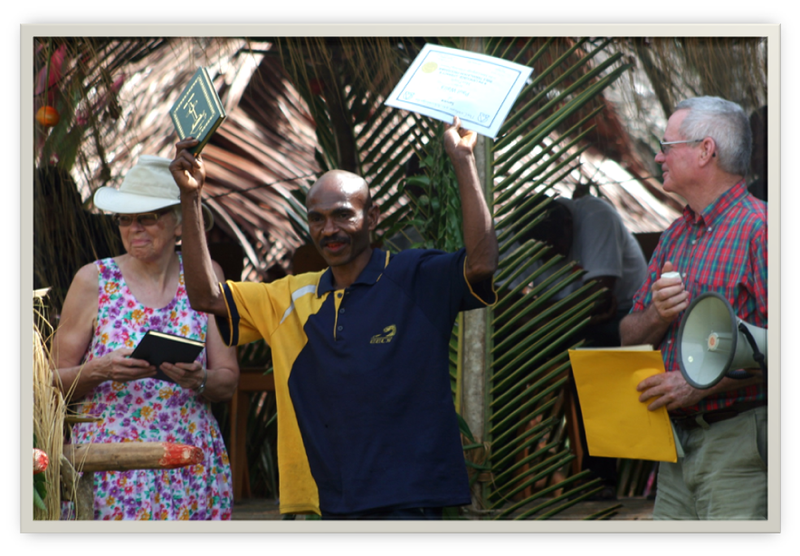 * Bible Translation Training at Buka finished yesterday with graduation. * Bible Translation Training in Alotau finished last week. * At Aitape West, the team have been involved in audio recordings, checking of I and II Timothy, demonstrating audio players in the market, and meeting with church leaders in a Church Engagement Day yesterday. A 4 member 'discovery team' came for 2 months. 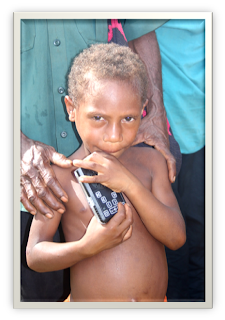 Their goals were to learn about the PNG culture, our work here, and to help if they could. One young man named Phillip attended one of the audio training sessions my dept. put on. He was very inquisitive. He went to a village and was intending to go there and work on translating some alphabet work for them, but upon arriving the people said 'we already have that, what we want is an audio recording of Genesis!'. Phillip was at first disappointed that his plan was shattered, but decided God was in control and investigated what they had to record with. 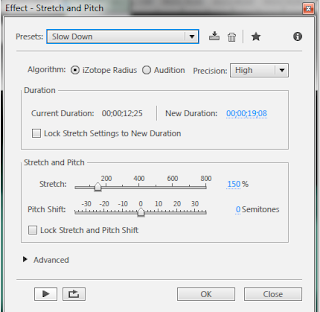 Amazingly, the software and equipment they had, happened to be exactly what he had been trained on in high school for audio recording. He was able to complete an entire Genesis recording for them in his time there, as well as put it on an AudiBible player for them. Upon returning to our home base here, he came to me, told me the story, and was completely ecstatic about it. I helped equip him with more AudiBibles, and more example Scripture and helped him to understand more of what he was doing, as well as send him back to the U.S. with demonstration items to show his church. This young man, whom I hadn't met until 2 months ago, is very on fire for audio recordings now, and is returning today to the U.S. to complete his education in Biblical theology studies. God knew what he was doing when he brought that young man here, and He began to prepare him, way back in high school if not before. 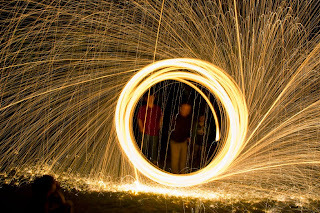 Spinning steel wool gives an awesome effect. In the center is high school alumni come back to visit family, to the left is me (big red blur) to the right is my son, who is oddly in focus. This is how we do Independence day here. It's not a national holiday. So the Americans get together after work around 5:30 or so, start up the bbq (often it is an Aussie style grill which is more like a flat skillet than a grill. Cook up burgers or dogs. "Yankee Franks" (a PNG product) which taste... um... not good. You can't really get decent hot dogs here. We pray for the country, and its leaders. And then, we light steel wool on fire and fling it. This year, we figured people would come prepared, but in case they didn't, I brought my box of tricks. And so we had a few pops and bangs... and bright lights. We gave the young kids glow sticks, someone had sparklers. 6 years ago, fireworks were unheard of, but our fourth of july parties have gotten increasingly more 'boom-able'. Someone brought a 'muli' cannon. Think potato launcher, only it launches native citrus fruit (like mandarin oranges). But I noticed no one was flinging wool. No one had brought the tool necessary to swing it. You need a piece of wire, to hold the wool on, and then a rope or string. No one was swinging wool, I was surprised. I asked around, and people HAD steel wool in their pockets. So I looked around, and I found an awning put up with pig wire, and I cut some excess off with my leatherman's tool I always carry. Then I took a shoe lace, and jury rigged up a flinging tool. Then my son gave me some wool, we prepped it, and I lit it with my Zippo that I had in my pocket for just such an occasion..
and BOOM... what you see above happened. I had kids lining up to do it for the first time, people asking me questions and thanking me. I was surprised because I hadn't intended to be the guy running the steel wool, everyone had just assumed someone else would bring the utensils. After we were done someone said 'thank you so much for making that work, my family was visiting, and it just isn't a PNG Fourth of July without steel wool!" They really were disappointed when they realized it might not happen, which is why I was trying to jury rig something. Steel wool really is more fun than fire-crackers. So... I'll reveal our secrets. --tie a shoelace or something similiar through the loop. --get some steel wool (NOT brillo pads or anything treated with soap) - the finer grain the better. -- light the wool on fire (my zippo works, but some people put it in a burning campire) ... you'll only see tinly little embers, that's enough. -slowly begin to rotate the shoe lace, being mindful not to let it hit the ground, and mindful of your arc because wool WILL fling off and light things on fire in it's path. -START spinning faster, until the wool completely burns out. -this is dangerous, don't do it in crowded areas. Best to do in wide open areas that sustain a lot of rainfall annually so as to not accidentally burn down houses. I suggest a tropical place like PNG. (I tried this in the US. and unless you're in a park or the beach, it simply isn't safe, I rained down fiery hot lumps onto several cars). If you're really interest, I welcome you to join us here on July 4th. We may not have fireworks displays, but we have this! In PNG they don't sell paint in gallons. They sell them in 4liter cans (a gallon) and 15 liter cans (close to 4 gallons). They sell flat bases, and then you have the paint tinted. Now I am told that Paint is one of those precious few things in life where you get what you pay for. My wife and I deliberated over this. We didn't come here to do home improvement, we didn't want to spend money on this house. We felt discouraged because we had already done all we wanted to for maintenance and repair of our current home, and now, we were going to have to start over because we are compelled to move. There is a supreme amount of satisfaction knowing that me, a man in my 30's was able to with creativity take a home built in the 60's that was falling apart in some places, and make it livable and usable for future families. But that dream has changed. I'm nearly a 40 year old man now, and another family will never live in this house, because it's being turned into office buildings for a local school. Our break even point was 6 years. Meaning, that I have tallied all costs of living in the house, verses renting a place, and have determined that if we lived in that house for 6 years, we would have broken even and all time AFTER that, would be gravy. Plus we wouldn't be forced to move, because we weren't renting. And given the added expenses, the break even point is now 8 years. Which means, we have another year and a half before we'll have reached the break even point. Why? Because we want the house to be in good repair. 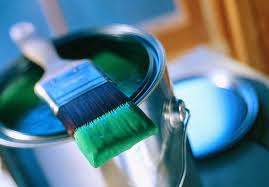 We want to paint, we want to fix things up a bit, so that the future of the house is good. The house was built in the 90's, but the weather and life here, has taken a bit of a toll. Long story short, we were about $1300 too low for what we wanted to do. My wife and I sat there and deliberated and crunched numbers and after much fuss, I decided 'look, it'll need to be done, the dollar is constantly losing power against the kina, it'll be more affordable now than in 2 years, let's do it and trust God it's the right thing and to supply the money." We prayed. I was not at all convinced that God wanted me to paint the house. I felt morally obliged to, but it was a social obligation, not a spiritual conviction. I honestly feel, (and this is my upbringing and culture) that you should leave something the same if not better than you originally received it. A house is something you care for, and it becomes a home. This particular house was built by Bible translators, and it has been loved and used in ministry. It has been rented now for a number of years so it hasn't been subject to the same care as it would had it's owners lived in it. So I couldn't let myself live in a house and not repair/maintain parts of it that need it. But I also couldn't see spending moneys intended for supporting Bible translation on home repair. Every bit of home repair we've done, has either been free (by creatively finding materials and doing labor myself), or by specially designated gifts from supporters. So there I was, torn between what seemed right, and what is frugal. And we prayed. Now I know not every culture feels the same way as I do. I know that people have different attitudes about how to care for and maintain property. (for example I have been told that in Japan, there is no market for 'used' equipment. There is no 'Ebay', culturally, they buy everything new, and throw their old stuff away. Which means dumpster divers hit the motherload!). We went ahead and bought all the paint we needed. We were hoping, that God would somehow supply the extra $1300 we needed. We drove home the next day and I got this email from my sister. "Chad, I got this odd letter from the bank. You have about $1300 sitting in the account they said has been dormant for a while, would you like to claim it?" It turns out, that Bank of America had tracked me down some 15 years after I had closed an account, to tell me I still had money in it. Is that not amazing?! Tell me that isn't God's timing! Tell me that letter was going to come any other day any other year regardless. Tell me there is no chance that God knew we'd need that money some 15 years ago, and had me 'accidentally' leave money in it. Tell me that was coincidence, and then, better get your spittle guard, because I'm going to laugh in your face. He does this for us all the time. Frequently. And each time I get goose bumps. This time, He got really creative and pulled in a bank I haven't used since before my daughter was born. God is amazing. I just.... can not.... contemplate.... any kind of life where He's not a part of it. This kind of stuff lifts your soul, encourages your spirit, reminds you that God is alive and intimately involved in your life. Like ivy wrapped around you, He is woven into the details of our lives, and He cares, and He plans, and prepares. He does the heavy lifting, all we really need to do is rely on Him and abide in Him.